The 40th Day Demo is Here! Make sure you have the space, as the demo is about 2 Gigs! 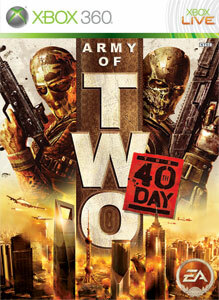 "Army of TWO™: The 40th Day has been built from the ground up as an incredible cooperative experience. The result is a bigger, better, more organic and immersive co-op experience that lets you put your best two-man tactics to use whenever and wherever you want. This demo allows you to play part of the first level in split-screen or online COOP."